I realized recently that my wardrobe is growing so fast I can barely keep up. Unfortunately, I'm buying a lot of the same types of things over and over again because it's comfortable (shirts. I have way too many shirts). With a closet full of shirts clothes, somehow my wardrobe still feels like it's lacking. I think this is in part to my lack of accessories. Believe it or not, accessorizing causes me a lot of wardrobe anxiety. I never know what looks right with what or if it's too much or any other number of issues. Since this whole blog is about pushing past my comfort zone, I've decided that February is accessory only month. I won't be adding any more clothing items to my closet. Not only will this get me experimenting with what I already have, it'll force me to be on the look out for accessories that speak to my aesthetic. Number 9 is a reminder that I'm ready for some new, unique piercings. I want February to be the month that I stop procrastinating and just go for it! 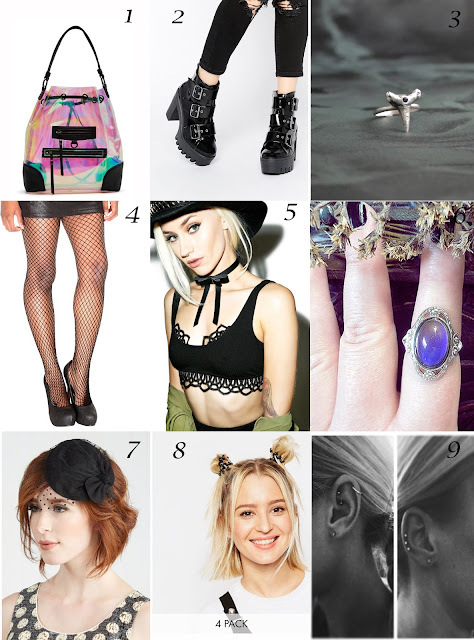 Curious about last month's Lust List? Of the nine things I listed, I only purchased two: the Lemurian Crystal necklace (which I can be found wearing here) and the book Smoke Gets in Your Eyes. I would high recommend both! I almost bought the Gwen palette but decided on the Urban Decay Vice 4 because it was cheaper and had a grungy burgundy color that I really wanted to experiment with. The rest just didn't excite me as much after a few weeks passed by. I think I saved myself money by thinking on these items over a month instead of making rash purchases! What about you? Do you have your eyes on anything in particular this month? Does anything from this list you find particularly lust worthy?